Widely known for their ease of use and accessibility, bank barns are specifically designed to be built on a sloped site. Before deciding if a bank barn is right for you, here are some details you should consider. What is a bank barn? Bank barns are two-story barns built into the side of a hill or bank. As a result, they provide ground access to both levels. Traditionally, the lower level is used for livestock while the upper level is used for equipment and feed storage. 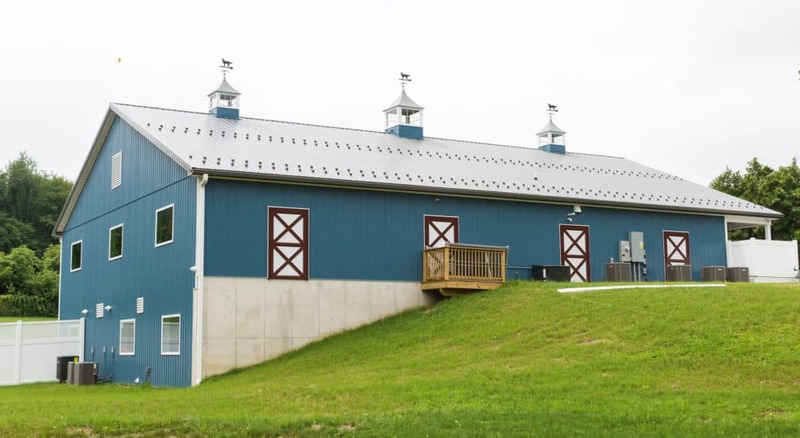 Although it is not uncommon for them to be built into the side of manmade hills, bank barns are perfect for property owners who would like to utilize an uneven site. What Should Be Included in a Bank Barn? Bank barns can provide all the elements of conventional barns and then some. Take a look at these ideas regarding construction, features, options, and decorative touches. Bank barns require foundations that can withstand the constant external pressure inherent with the design. Traditionally, this meant massive stone foundation walls. However, by utilizing reinforced concrete, it is possible to significantly lower costs without sacrificing strength and durability. The second floor is normally designed for supporting heavy loads. Traditionally, this meant large timber beams and thick wooden floor planks. As an alternative, it may be advantageous to utilize steel beams and a concrete floor. The first floor of traditional bank barns is known for being somewhat damp and humid. Well-placed ventilation is necessary to decrease humidity and prevent mildew build-up. Steep gable roofs easily repel rain and snow and provide increased storage capacity for the second floor. For gently sloping or level sites, it is necessary to construct a well compacted ramp for access to the second floor. As a nod towards traditional structures, many bank barns still utilize timber framing with traditional mortis and tenon joinery. Windows and doors provide natural light and ventilation. A forebay under a second-floor overhang is a common feature that provides protection from the elements. A lean-to can also provide protection from the elements and/or extra storage. An in-floor drainage system can help control dampness. Although bank barns offer a space that is cool in the summer and warm during winter, radiant floor heat adds extra warmth while cutting down on electric costs. There are significant costs associated with building bank barns. However, they are well worth the investment for the amenities they provide—an extra level with ground access to both floors and a barn that works with your land, whether a steep hill or slight bank. Quarry View would love to work with you to customize a beautiful and functional bank barn that’s just right for you. Contact us today, and let’s start building the foundation for a lasting relationship and your dream barn!